The condo is sunny, bright and beautifully designed with relaxation in mind. Facing West and North, the mid-day sun allows for lazy afternoons and beautiful sunsets. The oversize balcony has a large table with 6 chairs making it perfect for alfresco dining. Views to Palos Verdes, the Terminal Island Bridge and Palm Trees. 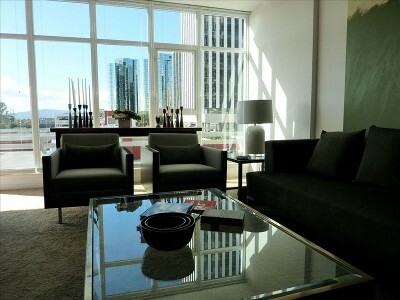 Located in the Best and Newest High Rise in Downtown Long Beach.The entire property is impeccably clean and a huge amount of time has been spent ensuring that your every need is met, so you can relax in your perfect home away from home. The kitchen is fully equipped and contains everything you need to cater for yourselves including: all stainless-steel gas kitchen includes, dishwasher, gas stove w/5 burners, electric oven, refrigerator with freezer and ice-maker, microwave, a stackable washer dryer plus both air conditioning ,forced air heating and under-counter lights. All small appliances including: waffle iron, blender, hand mixer, mix-master, toaster, crock pot, coffee maker, coffee bean grinder all pots and pans, cups and glasses, flatware and stemware, plates, bowls, cutting boards...everything needed and supplied! This property would also suit anyone visiting the city on business that requires an ideal and convenient location close to the business district. All pots and pans, custom pantry, small and large appliances are included. Custom 'Top down-bottom up' window coverings ensure for maximum shade inside and the blackout shades in both the bedrooms allowing for sleep anytime. A ceiling fan in the master bedroom offers a cooling breeze for those warm evenings. The living room is tastefully decorated and stylish. It features a custom sofa, comfortable lounging chairs, mid-century furnishing and a large glass coffee table with custom paint colors and lighting complete the living room. The living room can comfortably sit 6. The dining area has a large teak table with teak chairs and can accommodate dining for 6. The living room also has a 40' flat screen HGTV with Charter Cable including HBO, Showtime and 50+ channels and radio. Plus, plenty of books and games to keep everyone entertained. Maps, guides, menus and tourist information are provided. The master bedroom consists of a beautiful and very comfortable King bed, alarm clock and apple storage. The second bedroom consists of a Queen size bed providing comfortable sleeping. All linens are provided. Both bedrooms are carpeted with large windows looking to the balcony and views to Palos Verdes. Custom black-out shades are in both bedrooms. Both bedrooms have operable windows for great air flow. Both bedrooms have closets with custom closet organizers with plenty of hangers. Ample drawer space in the master bedroom. The master bedroom has an en-suite bath with granite counters, dual vanities, plenty of storage, a hair dryer and a large mirror to help you get ready for that night on the town or business event. All linens are provided. The second bath has a tub/shower combination with granite surround plus a large mirror. Both baths and all lights are on dimmers. Bedrooms have operable windows along with the living room for fresh air. The oversized and private balcony has a table and seating for 6 for alfresco dining or cocktails. The building is new, built is 2007, and offers the best of amenities including an outdoor heated pool, hot tub and dry sauna. There are many meeting rooms and quiet common area spaces including two well equipped gyms and BBQ's. Two side by side secure and deeded parking spaces are also included. The garage is gated and operated with an opener. Superior construction includes double dry wall for minimum noise transfer. The building has state-of-the-art security system. Two lobbies are manned 24/7 and all visitors and guests must register and be announced. Outside doors are locked and one can only gain entrance by using a ' FOB' to unlock. The unit is close to the best of everything Long Beach has to offer! 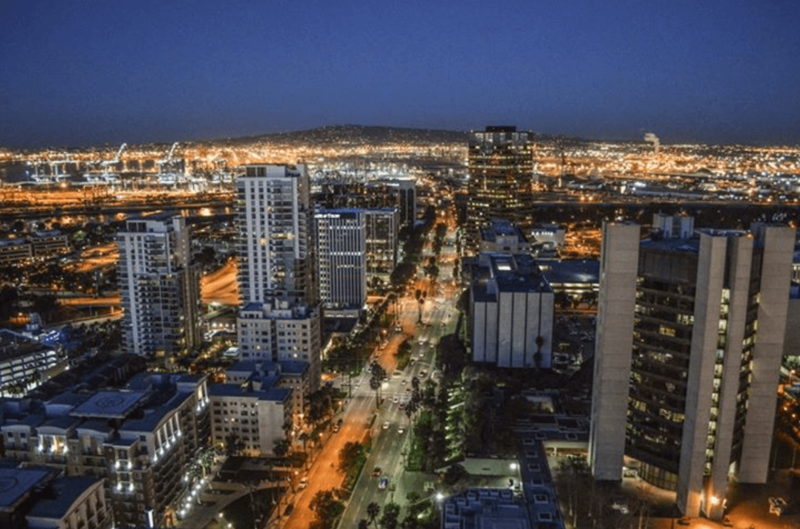 The Long Beach Convention Center, the Pike Marketplace, Rainbow Harbor, the Long Beach Aquarium, the Catalina Express and the East Village Arts District are all within walking distance. The trendy Pine Street corridor is just three blocks away. Many restaurants, shopping, cinemas and sheathes are all within close proximity. The building is conveniently located at the end of the 710 freeway so getting to places in and around Southern California including Disneyland, Universal Studios, Hollywood, Pasadena, the Long Beach Airport, Orange County, all beaches and the South Bay are very easy. The terminus of the Blue Line is also three blocks away making commuting to downtown Los Angeles or Union Station very easy. This is the perfect location to start or end your stay in Southern California. Many Long Beach activities are centered around the city's waterfront marina and downtown. Within an 8 block area, there are more than 100 restaurants, plus shopping and entertainment venues. The condo has a walk score of 92! There are two bicycles in a secured and locked room, along with helmets and tire air pump. Long Beach has many bike paths, one of which runs 5.5 miles along the sandy beach shoreline located 5 blocks from the building. The City, which has been ranked in the top 25 cities by Bicycle Magazine, has 45 miles of bike paths. It's a great and flat area to bike ride. The city of Long Beach also offers the opportunity to visit the stately Queen Mary. At one time the Queen was the world's fastest and most luxurious ocean liner. Today, she still adds color and a retro cachet to Long Beach Harbor, and entertains passengers in restrauants and on historical tours. 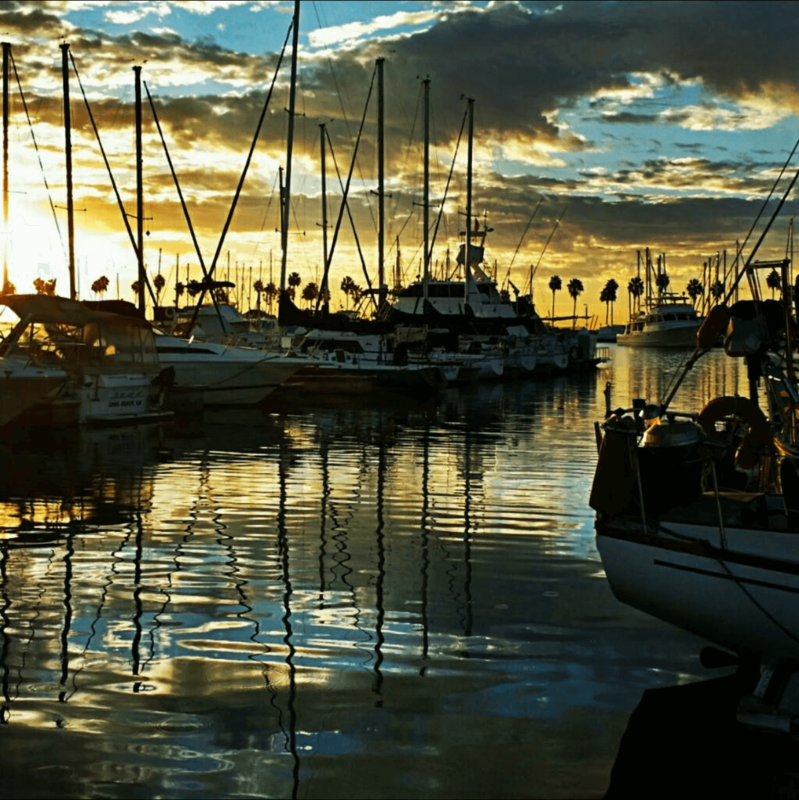 Long Beach, the fifth largest city in California has much to offer the visitor or resident. 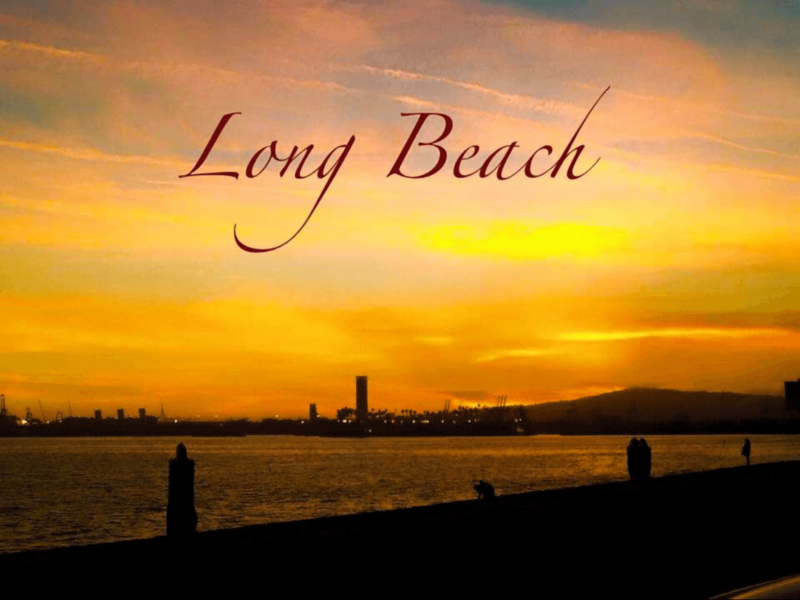 Spread out along five-and-a-half miles of sandy coastline, Long Beach is a beach community with lots of room to play. Many Southern California attractions are located close to the condo including the Aquarium, the Queen Mary, Rainbow Harbor, the East Village Arts District, the Pine Street and the Convention Center. Check out my on-line reviews!